Automatic Paper Baking Mould Machine is our newest machine in 2012, which is design from ourselves. 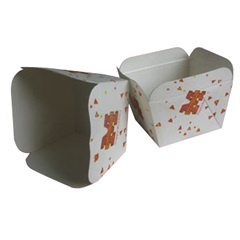 It is a ideal machine of making paper baking mould,paper loaf pan and paper baking pan. 1.High speed and efficient, the speed can reaches up to 25 per minutes. 2. Saving space, install expediently(Exterior size 1050×750mm) 3. Low power, about 1.5 kw.